In the beginning, all cars were convertibles. Not until 1914, when the Dodge Brothers come out with the first closed top car, did a car with a permanent top see the road. By 1925, sales of closed cars exceeded sales of open ones. This gave way to the production of more sedans. Apparently back in those days, canvas convertible tops were drafty and leaky. 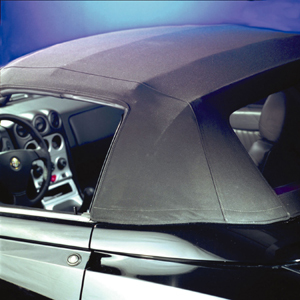 Too bad drivers back then didn’t have this Fabric Convertible Top Kit from 303, the renowned name behind the ever-popular Aerospace Protectant. This cleaner differs from other top cleaners, as it uses colloidal action to get the job done. Colloidal action was first used be scientists to break up particles in oil from oil slicks in our oceans. The oil literally would dissolve in the water. Think of this cleaning action in terms of the reaction of the atom in an atomic explosion. The atoms in the colloid lift, separate and hold in suspension the oils, grease, dust, and soils which have been penetrated. This breakthrough allows the ultra-wet water to hold grease, dirt, and oil in suspension, allowing them to dissolve within the water. This product is safe for all convertible tops, and also works wonders on fabric, velour, and carpeting. The 303 Convertible Top Cleaner is non-hazardous, non-flammable, and non-toxic. It is safe to use on tile, floors, doors, woodwork, ovens, and upholstery. This product protects all new or cleaned “outdoor” fabrics from water, dirt, grease, and UV sun damage. Outdoor fabrics include canvas convertible tops, cloth automobile seats and carpets, biminis, and boating enclosures. 303 High Tech Guard also resists soiling and mildew formation, by restoring an effective level of lost water repellency. There are no silicones within the product, and if you have used a silicone product before you know it does repel water. That’s about it though. Silicone treated fabric lasts on average 2-3 months, as compared to High Tech Guard that protects for up to three years. Silicone has that harsh, pungent smell; whereas High Tech Guard has a mild, clean odor. Most importantly, High Tech Guard is recommended by industry leaders that include AMCO Convertible Fabrics, Winnebago, Orvis, Thor, Sunbrella and Walt Disney World…and Autogeek! One treatment can last up to three years. Application Tip: 303 recommends cleaning the convertible top twice using a brush before applying the protectant. The surface should be as clean as possible to allow the protectant to bond properly. Q: How long will my High Tech Fabric Guard last? A: Once applied, you should not have to treat your convertible top again for another three years. The beauty of this product is that it can be used on your boating equipment as well, including sails, sailbags, boat covers, and all enclosures. 1. Other names for the convertible include phaeton and cabriolet. The term “cabriolet” is favored in Europe, whereas “convertible” is favored in the USA. 2. The Depression, beginning in 1929, drastically hurt the convertible industry, but ironically it was the years during the Depression that saw the emergence of some of the most extravagant convertibles ever. Cadillac and Chrysler and Auburn were three companies that produced these models in low numbers. 3. MG’s, Austin-Healeys, and Jaguars heated up the convertible scene in the 1950’s. Convertible sales then reached 5% of the market. 4. In 1976, due to a tremendous slide in sales, Cadillac branded the Eldorado, “the last convertible car in America”. Thank heaven that wasn’t the end! 5. Lee Iacocca improved the image of Chrysler in 1982 with the introduction of the LeBaron convertible. He had hoped for 3,000 sales that year, instead he was blessed with 23,000. Used on my vinyl top, worked great. Sealer beads water like a champ. Will buy again. Easy to use. Take times to protect the surrounding areas. Appears to have worked well! Another great product from 303. Easy to use. Should mask off Windows before using protective spray. Easy to apply. Need to experience wet weather conditions & repeated Washington to finalize review.